Hell on Wheels is a documentary about the Tour de France from the riders perspective.To quote director Paul Danquart:With Hell on Wheels I did not have a pure sports fi lm in mind…. I want to track down what it means to fall prey to the promise of global fame and tons of money, to suffer all the years to the verge of exhaustion but without the certainty to receive any reward. Just got back from watching “Hell on Wheels” at the Valhalla cinema in Glebe. Hell on Wheels is a documentary about the Tour de France from the riders perspective. With Hell on Wheels I did not have a pure sports fi lm in mind. My interest lies in the suffering and losing during the Tour. I want to track down what it means to fall prey to the promise of global fame and tons of money, to suffer all the years to the verge of exhaustion but without the certainty to receive any reward. I want to know what it takes to win the Tour. In the team. In the body. In the mind. Shooting the fi lm meant becoming part of a team and showing what others cannot show. Excellent movie, if you are into cycling I highly recommend it, but be quick as it is under limited release and will probably disappear quickly. It was good to see Mike Tomalaris , the SBS cycling presenter there. A big thank you goes out to him for the upcoming Tour de France coverage on SBS. Here we are during a Critical Mass ride cycling across the Sydney Harbour Bridge…. Once a year in November the northbound lanes of the Sydney Harbour Bridge are closed for about half an hour while the Critical Mass riders cycle through.Cycling over a car free Harbour Bridge has to be the best feeling in the world. Here we are during a Critical Mass ride cycling across the Sydney Harbour Bridge. Notice the lack of cars. 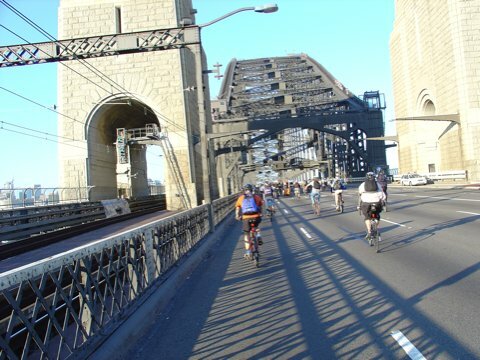 Once a year in November the northbound lanes of the Sydney Harbour Bridge are closed for about half an hour while the Critical Mass riders cycle through. Cycling over a car free Harbour Bridge has to be the best feeling in the world. My friend Wing can be seen just ahead in orange enjoying the experience. This photo is from the Friday, November 26, 2004 Critical Mass ride in Sydney. The following Sunday the Cycle Sydney event also rode through a car free Harbour Bridge but this time it was southbound on the Cahil Expressway.